The following tips and tricks may be useful to quickly become a Hackolade power user! If you need to move your license key to another computer, you first need to release it on the PC where your key is currently validated. and click the Send button. This will free up the key on our license server. 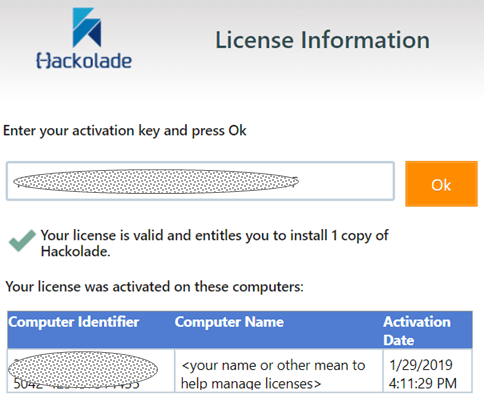 Make sure to copy the license key and store it (or find your original license key confirmation email) as you will need it to activate on the other computer where you will want to use Hackolade. 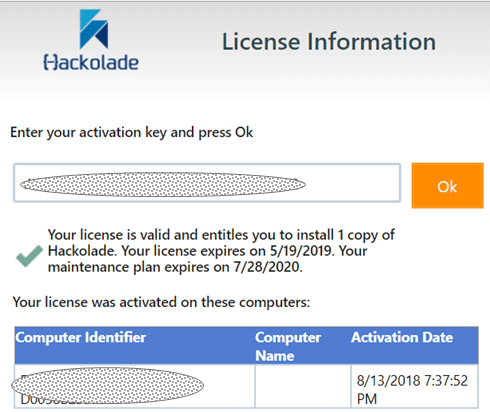 As of this moment, you can no longer use Hackolade on the original computer, unless you you re-register it. TIP: if your company has many licenses, your administrator may require that you enter your name in the Identifier (optional) field. To have identification information appear in the Computer Name column, users need to go to Help > Software Key Validation, then release their key, copy it to their clipboard, then fill in the identifier (name or whatever other standard you decide), paste the key, and validate again. TIP: you may create extra space on your desktop by sliding the Object Browser or Properties panes with this control appearing between the panes. You may also toggle the appearance of these panes in the View menu. TIP: to go back to the Welcome Page, simply choose View > Welcome Page. You may close the page, with the Close button on the lower right. TIP: in any of the Comments dialogs, you may press the timestamp button to log data and time for your entires. TIP: from the Object Browser, simply click on an attribute, and the central pane will switch to its location in the hierarchical tree view, with all the details in the Properties Pane. TIP: you may add attributes from the Object Browser with a right-click to display a contextual submenu. TIP: you may change the color of a shape title and frame by choosing from a palette that you can access by clicking the eye-dropper icon just to the left of the auto-resize icon. TIP: if you want to get the maximum level of zoom possible while showing all shapes in your diagram, simply click on the double-sided arrow icon in the application toolbar. TIP: after you've created shapes and relationships in the ER diagram, you may want to let Hackolade perform a basic distribution of the shapes according to an orthogonal formula, by choosing this grid-like icon in the toolbar..
You may also do a right-click and access the same functions through the contextual menu. TIP: create a relationship with drag-and-drop: simply grab a field from one collection with your mouse, and drop it on a type-compatible field in another collection (type-compatible fields in other collections are highlighted as long as the mouse button is pressed.) Be careful that the application considers the source as the child in the foreign key relationship, and the destination is the parent. After the relationship is created, you may change the relationship type (foreign key or foreign master) and the cardinality in the Properties Pane. TIP: All of the controls to view properties for and manipulate attributes are also available now from the ERD view and the Object Browser, without having to necessarily open the entity in a new separate tab. TIP: when you enter data in the Sample field of the Properties Pane, Hackolade dynamically generates a sample JSON Data document in the JSON Preview lower tab. TIP: there are 3 types of validations being performed in this double-pane view: JSON Schema errors, JSON Data errors, sample document errors. You may click on each title's button to view the individual errors, or ALL to see a consolidate view. TIP: changes being performed directly in this view can only be saved if they are properly validated. A button is provided to that effect. TIP: DynamoDB only: the sample document in JSON data is displayed by default as plain JSON. It can also be displayed as 'DynamoDB JSON. TIP: if you encounter issues during the Reverse-Engineering process, there is a log file HackoladeRE.log located on your drive at C:\Users\%userprofile%\AppData\Roaming\HackoladeLogs (Windows), or /home/$[user]/Documents/HackoladeLogs (Linux), or Documents\HackoladeLogs (Mac). If you send this file to support@hackolade.com, we'll be have more information to investigate. TIP: in MongoDB reverse-engineering, if you have instances with a very large number of databases, you may wish to declare a particular database directly in the connection string by appending the address with: /<name of the database you wish to access directly>, for example: localhost/NBA. Or you may declare the database name in the Advanced tab. TIP: if you get an error "not master and slaveOk=false" when connecting to a MongoDB instance, on a secondary member (for example, a replica set connection using a read preference of secondary or secondaryPreferred), you first need to run rs.slaveOk() to be able to freely run Hackolade's reverse-engineering. This is because, by default, MongoDB does not permit read operations from non-master (i.e., slave or secondary) instances.